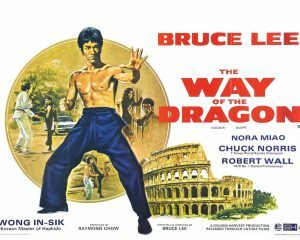 If, like me, you have only seen Bruce Lee in the wonderful, but portentous, ENTER THE DRAGON, than you might be surprised by this quite potty earlier film. In ENTER THE DRAGON, Lee was amused, but sombre; a fighting machine, pivotal piece in a deadly serious mythological puzzle, his strength never in doubt. The first third of this film couldn’t be more different. Played as (very funny) comedy, Lee is passive (we first see him waiting for someone), a figure of fun, a fish out of water, exagerratedly polite, bewildered by alien custom and language, as well as his own bowels. A number of scuffles take part early on in which he takes no part, and which make us doubt his prowess. Lee directed this film, and his visual conception is much more inventive that Robert Clouse’s (ENTER). Although it lacks the insane invention of A TOUCH OF ZEN, or the dizzy verve of Tsui Hark’s films, Lee is not content with simple ego gratification. His two directorial mentors seem to be Melville and Leone. The former (hugely influenced by Oriental martial discipline himself) gave him a hero who is narcissistic (check the opening shot), whole; whose physical prowess is ironically the result of mental superiority, an almost Zen laid-backness; concealing the coiled, taut, muscle-burst of Lee’s beautiful body. Kung Fu is primarily an art of self-defense, and this film returns to these roots: its conception of protecting the oppressed rings throughout the film (in the seemingly gratuitous picture-postcard scenes, Lee makes the connection between European colonial splendour, and the poverty and repression of Hong Kong). Chuck Norris’s character has betrayed Kung Fu by siding with the oppressor – his art is bestial and clumsy, lacking the spare geometric elegance of Lee’s. But Kung fu’s self-defense is also a defence of one’s ‘self’ (this is where Melville comes in) – it protects one from any threat to one’s powerful wholeness, especially women (and men. There is a slight whiff of homophobia, mitigated by the outrageous campness of the film (all that red! The whole idea of SHANE recast in a restaurant!). This is ironic, since it is the proof of Lee’s martial art power that makes the initially sceptical heroine (very stylish and lovely) fall for his charms (and who can blame her?). Lee’s second master is Sergio Leone, from whom he has learnt an irreverent approach to genre, with jokey zooms, close-ups and cuts; mocking, yet mournful and melancholic Morricone-esque music; a ritual stand-off between mythical archetypes (an awesome set-piece in the Colosseum), with the film’s heart belonging to the slightly silly, but loveable, subsidiary characters. The use of these iconoclastic directors adds a reflective and critical dimension to a genre previously (in its most populist form) a showcase for male vanity (although Lee never lets us forget how gorgeous and sweetly small and cuddly he is). A supremely entertaining film which unexpectedly achieves a climactic power and melancholy.